President George W. Bush is greeted by U.S. Ambassador Sandy Randt upon his arrival Friday, Aug. 8, 2008, at the U.S. Embassy in Beijing. 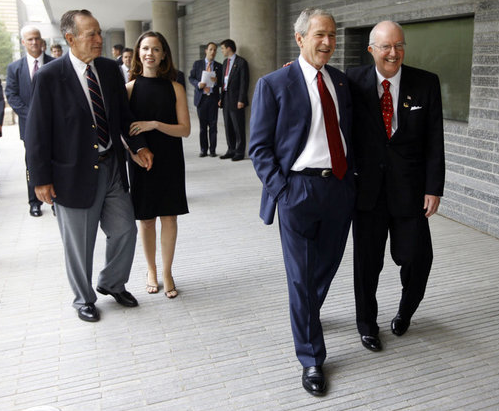 With them at left are former President George H.W. Bush and Ms. Barbara Bush. White House photo by Eric Drape. Fishville's Notes: 在他成为美国驻华大使后的一个新闻发布会上，桑迪.雷德描述了他是怎样得到这份工作的。作为律师他在香港经商多年。有一天，他接到了他的前耶鲁大学兄弟会会长的电话问他是否对空缺的驻华大使感兴趣。雷德指出他很幸运, 因为电话线的另一端的人就是新当选的美国总统小布什。以前的美国驻华大使要么是职业外交家或是退休的参议员, 耶鲁的友谊使一个商人成为大使。奥巴马总统今天提名骆家辉为下届美国驻华大使, 这将是近来第二位代表美国出使中国的耶鲁毕业生. 骆家辉拥有耶鲁的政治科学学士学位. In one of his news conferences after he became the U.S. Ambassador to China, Sandy Randt described how he got the job. He was a lawyer doing business in Hong Kong for many years. One day he got a phone call from his former Yale fraternity brother who asked him if he is interested in becoming the ambassador to China. Randt pointed out that he was lucky enough that the person on another end of the phone line was apparently the newly elected president of the United States George W. Bush. Previous individuals who held ambassador position were either professional diplomats or retired Senator, Yale friendship made possible for a businessman to become an ambassador. Today’s nomination of Gary Locke (骆家辉) by president Obama as the next U.S. Ambassador to China will mark the second Yalie in recent memory to represent America in China as Locke also had spent his four youth years in New Haven. China is a country where grand gestures play well. So when U.S. President Barack Obama appointed Republican pooh-bah Jon Huntsman Jr. as the American Ambassador to China back in 2009, Beijing was pleased to welcome such an august envoy to its shores. The excitement has since died down, particularly in recent days after Huntsman was caught visiting a Beijing shopping district that had been designated by online activists as a protest spot—and later issued a forceful statement condemning attacks on foreign journalists at the site by Chinese security forces. Now that Huntsman is leaving China this spring, possibly to explore a 2012 Republican presidential bid against his current boss Obama, speculation was rife in Beijing as to who could top such a high-profile envoy. By appointing Gary Locke, the Chinese-American Commerce Secretary, as the new Ambassador to China, Obama appears to have succeeded in the one-upsmanship game. There are two reasons why Locke will likely be warmly received by Beijing: his résumé and his race. Second, Locke's Chinese heritage. A third-generation Chinese-American who neither speaks Mandarin nor has spent any significant time in the land of his ancestors, Locke will still be welcomed “home” by China. Unlike Asian countries such as Japan that tend to harbor suspicions of émigrés, China has a far more embracing attitude toward the Chinese diaspora scattered across the world. (It also helps that Locke's wife has vague family ties to Sun Yat-sen, the founder of modern China.) The “you're one of us” approach may mean that Locke will not be reflexively dismissed as some foreign imperialist intent on denigrating a rising China. The flip side to the race card is that ethnically Chinese foreigners working in China are often held to a different standard than other outsiders. Take a look at foreign businessmen jailed in China for various infractions real and imagined—and a disproportionate number of them are ethnically Chinese. Even foreign journalists of Chinese heritage are sometimes lectured when reporting on politically sensitive issues, as if they're somehow betraying their blood ties by uncovering Chinese government abuses. Still, Locke's appointment is a good thing for Sino-American ties, which despite a cordial summit between Obama and Chinese President Hu Jintao earlier this year, have become increasingly strained. But no one, not even as careful and respected a politician as Locke, will be able to single-handedly unsnarl one of the 21st century's most complicated bilateral relationships. Grand gestures, Obama is no doubt discovering, only get so far, even in China.